Transparency International’s landmark annual report has put Australia in 13th place. This year, Australia scores 77 on the Corruption Perceptions Index – down 8 points since 2012. The Corruptions Perceptions Index (CPI) is the most widely used indicator of corruption worldwide. It assesses the level of public sector corruption in each of the world’s 180 countries according to data from expert independent institutions. This year’s index shows the majority of the world’s countries are making little or no progress in ending corruption. It reveals that the continued failure of most countries to significantly control corruption is contributing to a crisis in democracy around the world. The theme of this year’s CPI report focuses on democracy because of the strong correlation between corruption and autocracy. When our democratic institutions are transparent and accountable, our democracy is healthy and robust. Australia used to rank among the top ten least-corrupt countries. We fell out of the league of world-leading nations back in 2014 and continuously fail to lift our game. Strengthening our democracy must be a priority for 2019. 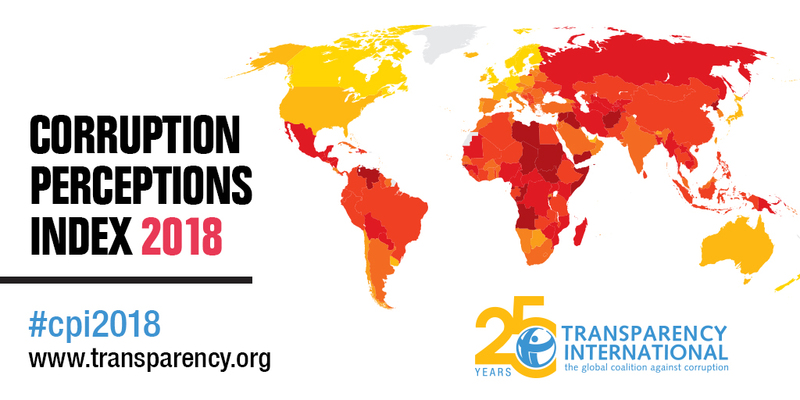 This year, Transparency International Australia will continue to call for greater transparency and accountability across government and business. We will continue to push for a strong, independent and comprehensive national anti-corruption agency; and for better laws to protect whistleblowers, stop money laundering and control foreign bribery. You can help our work by becoming a member, sponsoring or attending our upcoming conference, and following the conversation on social media. You can also have your say on the National Integrity System Assessment through this survey. As ever, we are grateful for your support.